The idea of painting the outside of a house is a huge project on its own, and for most of us, it can be a huge undertaking. But as big of a project, as this is, it does come with its own unique ways to make the experience simpler. 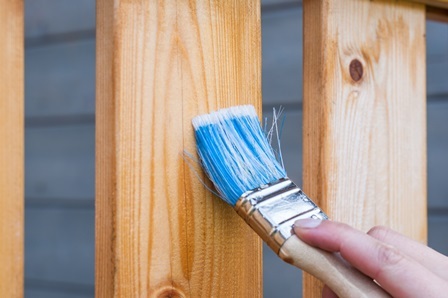 We created a small set of tips to help you start painting the outside of a house fast and easy. When you are painting the outside of a house, you want to start with the boring stuff first. The idea is to deal with the most challenging parts first. The eaves will be one of those problems for example. We recommend you to think outside the box here and identify the most challenging parts so you can deal with this project the right way. Dedication and coordination are key here. You need to start with one side of the house for now. Finish that side, and only then you can focus on the other sides too. Purchasing some high-quality painting equipment, a ladder and so on can go a long way. Protective equipment for yourself should also be a part of this list, so try to take that into account if you can, and the experience will be quite interesting in the end. Should you do satin or flat finishes? The flat paint is great if you want to resume painting or change colors at a later time. It doesn’t showcase any sign of overlapping, which is nice. On the other hand, you have to keep in mind the fact that satin finishes are easier to clean. So, it’s a combination of fast cleaning versus high quality. Yes, if you want to start painting the outside of a house properly, you do need high-quality paint. Try to invest in the best possible quality on the market, and you will like the results a lot. You shouldn’t rush into things like this. They do take quite a bit of time, but it can be worth it for sure. If you can talk with a professional to tell you what paint you should use, the outcome can be very good. That’s up to you. Brushing and rolling can help you a lot if you want to have more control. If you want to use paint spraying, you do need to mask before you paint and that can be very time-consuming. In the end, painting the outside of a house is a labor of love so it can take a bit of time to do it right. But once you do that and you avoid rushing, the results can be more than ok. Just consider all the options and identify the best way you can start painting. The outcome can be a very good one!